I apologize at the start for the brevity of this review of BLOOD ON THE MOUNTAIN. The brevity is not because the film is bad rather because it is damn near perfect that there is very little to discuss. All I can really do is hand off to you and say see it. 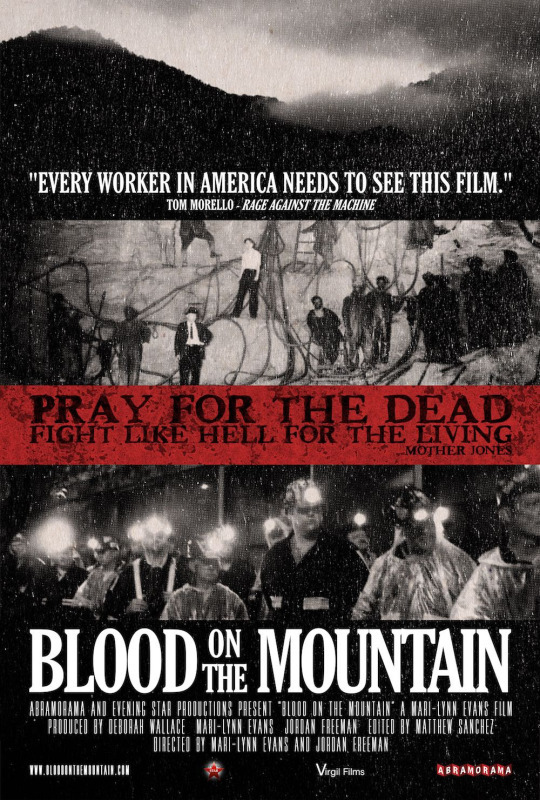 The film is a history of coal mining in West Virginia, but in reality it’s the history of it everywhere. What has happened in West Virginia is simply the most extreme example of what can and did happen where coal is mined. Beginning with the discovery of coal as a miracle fuel in the 1820’s and 30’s and then working its way all the way up today the film covers it all. We get the rich guys buying up land, the creation of company towns, the valuelessness of human life (you kill a man no problem, kill a mule you get fired), the poor working conditions, unionization, mechanization, the decline in usage, the destruction of the local economy by only being coal based, the change to strip mining and the destruction of the landscape. It’s all here and its beautifully laid out. Yes you can say that the film leans toward the labor side but frankly unless you’re a robber baron or have stock in coal there really isn’t away to present in any other way. This is as near a perfect documentary as I have seen. Watching it I kind of became in awe of it all simply because I was enjoying how it was hitting every point I could think of. And lest you think this is just about coal, it’s not. This is a dire warning about what happens when big business and destructive industries are allowed to run rampant across the land. It’s a warning that must be headed now that a member of big business has taken a seat in the White House. BLOODON THE MOUNTAIN opens Friday in theaters.